From 320-550 CE, the Gupta Empire assimilated neighboring kingdoms, through conquest or political alliances. Sri Gupta founded the Gupta Empire c. 240-280 CE, and was succeeded by his son, Ghatotkacha, c. 280-319 CE, followed by Ghatotkacha’s son, Chandragupta, c. 319-335 CE. Chandragupta’s son, Samudragupta, assumed the throne in 335 CE, and conquered several neighboring kingdoms; eventually, the Gupta Empire extended across the entire Indian subcontinent. Samudragupta was succeeded by his son, Chandragupta II, who continued to expand the Gupta Empire through conquest and political alliances. Ashwamedha: A Vedic ritual horse sacrifice; Samudragupta commemorated his territorial conquests with one of these rituals. The Gupta Empire, founded by Maharaja Sri Gupta, was an ancient Indian realm that covered much of the Indian Subcontinent from approximately 320-550 CE. Gupta rule, while solidified by territorial expansion through war, began a period of peace and prosperity marked by advancements in science, technology, engineering, art, dialectics, literature, logic, mathematics, astronomy, religion, and philosophy. The Gupta Empire was believed to be a dynasty of the Vaishya caste, the third of the four Hindu castes representing merchants and farmers. Founded by Sri Gupta c. 240-280 CE, there are contradictory theories regarding the original homeland of the Guptas. Historians believe Sri Gupta and his son may have been Kushan vassals, or rulers who swore allegiance to the Kushan Empire. Sri Gupta’s son and successor, Ghatotkacha, ruled from c. 280-319 CE, while his son, Chandragupta, ascended the throne around 319 and ruled until 335 CE. Chandragupta married princess Kumaradevi from the Kingdom of Magadha, which was one of the Mahajanapadas (or great countries) of ancient India during the 4th century CE. With a dowry and political alliance from the marriage, Chandragupta conquered or assimilated the kingdoms of Magadha, Prayaga, and Saketa. By 321 CE, he established a realm stretching along the Ganges River to Prayag, the modern-day city of Allahabad, in the Indian state of Uttar Pradesh. Hindus believe the god Brahma offered his first sacrifice after creating the world at Prayag. Queen Kumaradevi and King Chandragupta I: A coin from the period of Indian Emperor Samudragupta, 335-380 CE, depicting his parents, King Chandragupta and Queen Kumaradevi. Samudragupta succeeded his father, Chandragupta I, in 335 CE, and ruled for about 45 years. He conquered the kingdoms of Ahichchhatra and Padmavati early in his reign, then attacked neighboring tribes, including the Malwas, Yaudheyas, Arjunayanas, Maduras, and Abhiras. By his death in 380 CE, Samudragupta had incorporated over 20 kingdoms into his realm, and extended the Gupta Empire from the Himalayas to the Narmada River in central India, and from the Brahmaputra River that cuts through four modern Asian nations to the Yamuna— the longest tributary of the Ganges River in northern India. To celebrate his conquest, Samudragupta performed the royal Vedic ritual of Ashwamedha, or horse sacrifice. Special coins were minted to commemorate the Ashvamedha, and the king took the title of Maharajadhiraja (or “King of Kings”) even higher than the traditional ruler’s title of Maharaja. According to the Gupta records, Samudragupta nominated his son, Prince Chandragupta II, born of Queen Dattadevi, as his successor. However, his eldest son, Ramagupta, may have been his immediate successor until he was dethroned by Chandragupta II in 380 CE. 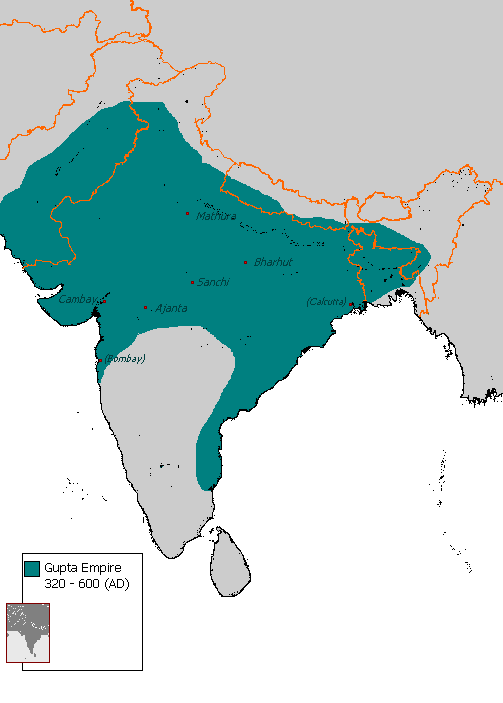 Gupta Empire, 320-600 CE: The Gupta Empire expanded through conquest and political alliances until 395 CE, when it extended across the entire Indian subcontinent. After gaining power, Chandragupta II expanded the Gupta Empire through conquest and political marriages until the end of his reign in 413 CE. By 395 CE, his control over India extended coast-to-coast. At the high point of his rule, Chandragupta II established a second capital at Ujjain, the largest city in the modern state of Madhya Pradesh in central India. Ujjain, on the eastern bank of the Kshipra River, remained an important political, commercial, and cultural hub through the early 19th century. Vikramaditya is the name of an emperor of ancient Indian legend, characterized as the ideal king known for generosity, courage, and as a patron of scholars. A number of historians believe that some of these legends are based on Chandragupta II, who is thought to have adopted the title of Vikramaditya. In the legends, Vikramaditya is said to have thwarted an invasion by the Saka, a group of eastern Iranian nomadic tribes, also known as Scythians, and gained the title of Sakari, or Enemy of the Saka. Chandragupta II conquered the western Indian region of Malwa after defeating the Western Kshatrapas, a branch of the Sakas, as well as expelling the Kushana Empire from the northern Indian city state Mathura. These victories were likely transposed onto the legendary character of Vikramaditya. Chandragupta II issued gold coin types introduced by his father, Samudragupta, but also introduced several new types of coins, differentiated by the designs on the face of each coin line, such as the Archer or the Tiger-Slayer. He was also the first Gupta king to issue silver coins. One of the most curious structures in Delhi, India (an iron pillar dating back to the 4th century CE) bears an inscription stating that it was erected as a flagstaff in honor of the Hindu god Vishnu, and in memory of Chandragupta II. The pillar, made of 98% wrought iron, is considered a highlight of ancient Indian achievements in metallurgy; it has stood more than 1,600 years without rusting or decomposing. Iron Pillar of Delhi: The Iron Pillar of Delhi, India, erected by Chandragupta II to honor the Hindu god Vishnu, in the 4th century CE. Despite the expansion of the Gupta Empire through war, there were numerous examples of cultural sophistication during the Gupta era, with architecture, sculptures and paintings surviving as reminders of the creativity of the time. Under Gupta rule, a number of notable scholars thrived, including Kalidasa, considered the greatest poet and dramatist of the Sanskrit language; Aryabhata, the first of the Indian mathematician-astronomers who worked on the approximation for Pi; Vishnu Sharma, thought to be the author of the Panchatantra fables, one of the most widely-translated, non-religious books in history; and the Hindu philosopher Vatsyayana, author of the Kama Sutra. The period of Gupta rule, especially the reign of Chandragupta II, is still remembered as the Golden Age of India. The prosperity of the Gupta Empire produced a golden age of cultural and scientific advancements. Prosperity in the Gupta Empire initiated a period known as the Golden Age of India, marked by extensive inventions and discoveries in science, technology, engineering, art, dialectic, literature, logic, mathematics, astronomy, religion, and philosophy. Chandragupta II promoted the synthesis of science, art, philosophy, and religion, in part because his court contained the Navartna, or the Nine Jewels, a group of nine scholars who produced advancements in many academic fields. Chinese traveler Fa Xian visited India from 399-405 CE, during the reign of Emperor Chandragupta II. He recorded all of his observations in a journal that was later published. Golden Age of India: A period at the height of the Gupta Empire, marked by extensive inventions and discoveries that contributed to Hindu culture, in subjects such as science, technology, engineering, art, dialectic, literature, logic, mathematics, astronomy, religion, and philosophy. Chandragupta II: His reign, from 375-415 CE, promoted the synthesis of science, art, philosophy, and religion during the Golden Age of India. Fa Xian: A Chinese traveler who recorded detailed observations about his experience in the Gupta Empire in his journal. It was later published. Navartna: Also called the Nine Jewels; a group of nine scholars in the court of Chandragupta II who contributed many advancements in their academic fields. ayurvedic: A form of alternative medicine established in India. The prosperity created under the leadership of the Gupta Empire, which covered much of the Indian subcontinent from approximately 320-550 CE, enabled the wide pursuit of scientific and artistic endeavors. This period became known as the Golden Age of India because it was marked by extensive inventions and discoveries in science, technology, engineering, art, dialectic, literature, logic, mathematics, astronomy, religion, and philosophy. These discoveries crystallized elements of what is generally considered Hindu culture. Although Chandragupta I and his son, Samudragupta, were prominent rulers, the reign of Chandragupta II included the greatest promotion of science, art, philosophy, and religion by the government. Chandragupta’s court was even more influential than those that came before or after because it contained the Navaratnas, or the Nine Jewels, a group of nine scholars who produced advancements in many academic fields. These scholars included Aryabhata, who is believed to have envisioned the concept of zero, as well as working on the approximation for the long-form number Pi. Aryabhata is also believed to be the first of the Indian mathematician-astronomers who postulated the theory that the Earth moves round the Sun and is not flat, but instead is round and rotates on its own axis. He also may have discovered that the moon and planets shine due to reflected sunlight. Varahamihira was an astronomer, astrologer, and mathematician, whose main work is a treatise on mathematical astronomy. Sushruta, a famed Indian physician of the Gupta period, wrote the Samhita, a Sanskrit text on all of the major concepts of ayurvedic medicine, with innovative chapters on surgery. Other scholars of the Golden Age helped create the first Indian numeral systems with a base of ten. The game of chess also likely originated during this period, where its early form, Chaturanga, contained game pieces for infantry, cavalry, elephants, and chariots, each of which would evolve into the modern pawn, knight, rook, and bishop, respectively. Krishna and Radha playing Chaturanga: Scholars during the reign of Chandragupta II contributed many scientific advancements in the fields of astronomy, mathematics, and medicine. Kalidasa, considered the greatest poet and dramatist of the Sanskrit language, also belonged primarily to this period. He wrote plays, such as Shakuntala, which is said to have inspired the famed German writer and statesman, Johann von Goethe, centuries later. Kalidasa also became renowned for his study of the shringara, or romantic, element of literature. The Indian scholar and Hindu philosopher Vatsyayana, authored the Kama Sutra, which became a standard work on human sexual behavior, while Vishnu Sharma was thought to be the author of the Panchatantra fables, one of the most widely-translated, non-religious books in history. of the highest quality. The walls of Buddhist shrines and monasteries were decorated with colorful frescoes, a type of wall paintings. These showed scenes from the life of the Buddha, the ascetic and philosopher, who lived in the eastern part of the Indian subcontinent sometime between 6th and 4th centuries, on whose teachings the Buddhist religion is based. Some shrines were cut out of the cliffs, and although dark, they were also decorated with sculptures and paintings. The Dashavatara Temple: The Golden Age of India produced many temples, decorated with various sculptures and paintings, such as the Dashavatara Temple, also known as the Vishnu Temple, in central India. The Gupta Dynasty promoted Hinduism, but supported Buddhist and Jain cultures as well. Gupta Buddhist art influenced East and Southeast Asia as trade between regions increased. The Gupta Empire became an important cultural center and influenced nearby kingdoms and regions in Burma, Sri Lanka, and Southeast Asia. Classical forms of Indian music and dance, created under the Guptas, are still practiced all over Asia today. Fa Xian was one of the first Chinese travelers to visit India during the reign of Gupta Emperor Chandragupta II. He started his journey from China in 399 CE, and reached India in 405 CE. He recorded all of his observations in a journal that was eventually published. Rajgriha. His writings express pleasure in the mildness of the administrations in these places. After many years of dominance, the Gupta Empire collapsed in 550 CE, due to invasions and weak leadership of successive rulers. Huns, invaded Gupta territory and caused significant damage to the empire. invasions from the east, west, and north. Chandragupta II: The emperor of the Gupta Dynasty of ancient India from c. 380-415 CE. Kumaragupta I: Son of Chandragupta II; the emperor of the Gupta Dynasty from c. 415-455 CE. Skandagupta: Son of Kumaragupta I; the emperor of the Gupta Dynasty from c. 455-467 CE. Huna: A Central Asian Xionite tribe that consisted of four hordes that repeatedly invaded Gupta territory, and helped cause the downfall of the Gupta Empire. The Gupta Empire flourished, in military and territorial conquests as well as cultural and scholastic advancements, during the reign of Emperor Chandragupta II. Yet the succeeding rulers, beginning with Kumaragupta I and then Skandagupta, oversaw the eventual end of the Gupta Empire through military defeats, devalued money and withering leadership. In 415 CE, Chandragupta II was succeeded by his second son, Kumaragupta I, who ruled successfully until 455 CE. The late years of his reign, however, faced difficulties. The Pushyamitras, a tribe of central India, rose up in rebellion against Kumaragupta, while Gupta territories were invaded by the Western Huna people, also known as White Huns. Kumaragupta defeated both groups and celebrated his victory by performing the royal Vedic ritual of Ashwamedha, or horse sacrifice, which had previously been performed by his grandfather, Emperor Samudragupta, to celebrate his own great military victories. Coin of Kumaragupta I: A silver coin from the reign of Gupta Emperor Kumaragupta I, c. 415-455 CE. As his grandfather and father did before him, Kumaragupta also issued news coins to mark his reign. They were stamped with images of his namesake god, Lord Kumara, regarded by Hindus as Regent of Earth. Upon Kumaragupta’s death in 455 CE, his son, Skandagupta, assumed the throne and ruled until c. 467 CE. He is considered the last of the great Gupta rulers prior to the collapse of the empire. Skandagupta, who was celebrated as a great warrior for his victorious clashes with the Huns during his father’s reign, defeated several rebellions and external threats from the Huna people, notably an invasion in 455 CE. Although victorious, the expenses of the wars against the Hunas drained the empire’s resources. The value of the coinage issued under Skandagupta becoming severely reduced. Coin of Skandagupta: A coin emblazoned with the image of Gupta Dynasty Emperor Skandagupta, who ruled c. 455-467 CE. The Huna were a Central Asian Xionite tribe that consisted of four hordes: Northern Huna, also known as the Black Huns; Southern Huna, the Red Huns; Eastern Huna, the Celestial Huns; and the White Huns, the Western Huna. The White Huns, those who invaded the Gupta Empire during the reign of Kumaragupta, were also known as the Hephthalites, and caused great damage to the failing Gupta Empire. Skandagupta died in 467 CE, and was followed onto the throne by his half-brother, Purugupta, who ruled from 467-473 CE. Thereafter came a succession of weak kings, beginning with Kumaragupta II from 473-476 CE, followed by Budhagupta, the son of Purugupta. The Hephthalites broke through the Gupta military defenses in the northwest in the 480s, during the reign of Budhagupta, and by 500 CE much of the empire in northwest was overrun by the Huna. The empire thereafter disintegrated into numerous regional kingdoms, ruled by chieftains. A minor line of the Gupta Clan continued to rule Magadha, one of the 16 Indian Mahajanapadas, or “Great Countries,” but the Gupta Empire fell by 550 CE.